A new study warns that more than 25 percent of sharks in the north-east Atlantic are at risk of extinction. Another 20 percent have been put in the near-threatened category, according to research for the International Union for Conservation of Nature (IUCN); and the figures may be an underestimate as there is insufficient data to assess more than a quarter – 27 percent – of species. The IUCN Shark Specialist Group (SSG) who drew up the report said it should serve as a dire warning that more needs to be done to protect sharks. Most of the damage is inflicted by overfishing and by sharks caught as a by-product either in nets or on long-lines. But sharks are being increasingly targeted by commercial fishermen for their fins which can fetch as much as £400 per kilo ($1500/ pound -MB) on the Asian food market. Because sharks are long-lived and slow to mature they are not prolific breeders, which makes them even more vulnerable to over-exploitation; because of their position at the top of the food chain, they have a critical role in maintaining the balance of ocean ecosystems. The SSG study looked at the 116 species of shark, closely related rays and chimera (from two different species) in the north-east Atlantic. It found that 26 percent are threatened with extinction – much higher than the comparable global figure of 18 percent. Seven percent are critically endangered, seven percent are endangered and 22 percent are vulnerable. A further 20 percent are near threatened. 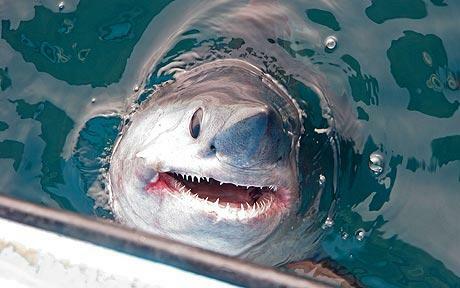 Two sharks most at risk – spiny dogfish and porbeagle – are the most sought after in Europe for their meat. Both are subject to EU fishing quotas that are well above the zero catch mark recommended by scientists with the International Council for Exploration of the Sea (ICES). The spiny dogfish often ends up on the menu bill as Rock Salmon or in fish and chips and the migratory porbeagle as swordfish. It is also much prized for its fins. Sonja Fordham, Policy Director for Shark Alliance, a coalition of conservation and scientific groups, said she had no doubt that some fishing nations were deliberately targeting sharks because of their value despite claiming they were being caught only as a by product. She said only four species – basking shark, great white shark, dogfish and porbeagle have legal protection under EU law while only the UK and Sweden provided full protection for certain shark and ray species. Apart from some agreements between the EU and Norway there are no international catch limits on north east Atlantic sharks. *Improving scientific data on shark species to determine their true conservation status. *Scientific advice on catch limits should be heeded. *Minimising catches through better technology and more selectivity. *An end to finning by ensuring sharks caught legally are landed with their fins intact. Angel sharks and common skate: Classed as critically endangered. ICES has called for an end to the fishing of common skate and for angel sharks to be given the highest possible protection. Gulper shark: Critically endangered. One of se veral deep water species sought for its rich liver oil that is used in cosmetics. ICES has recommended a zero catch limit for deep water species. Sawfish: Two types are listed as critically endangered but may already be extinct. Guitarfish: Two species are classified as endangered. They are rays whose fins are highly prized for use in shark fin soup. There are no European limits on catches of guitarfish. Basking shark: Officially described as endangered in the north east Atlantic. The world’s second largest fish is now protected in EU waters but remains vulnerable because of the value of its huge liver and fins. Bigeye thresher: Listed as vulnerable and at the greatest risk of over fishing by open ocean long line fisheries. Tope: Data deficient but England and Wales have brought in precautionary bans on targeted fishing. Blue shark: The dominant species taken in longline fisheries considered near threatened. No subject to any EU or international catch limit.